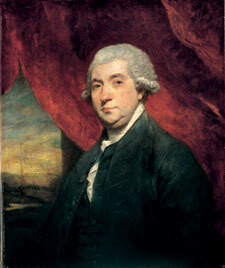 James Boswell, 9th Laird of Auchinleck was a lawyer, diarist, and author born in Edinburgh, Scotland; he is best known for his biography of Samuel Johnson. His name has passed into the English language as a term (Boswell, Boswellian, Boswellism) for a constant companion and observer. Boswell is also known for the detailed and frank journals that he wrote for long periods of his life, which remained undiscovered until the 1920s. These included voluminous notes on the grand tour of Europe that he took as a young man and, subsequently, of his tour of Scotland with Johnson. His journals also record meetings and conversations with eminent individuals belonging to The Club, including Lord Monboddo, David Garrick, Edmund Burke, Joshua Reynolds and Oliver Goldsmith. His written works focus chiefly on others, but he was admitted as a good companion and accomplished conversationalist in his own right.